Sarah Wells Abby Bag Review! Having a pumping bag was a priority for me because I knew that I wanted to make pumping around the clock, as easy as possible. A lot of my friends had their Sarah Wells bags which came with high recommendations from their friends and so on, so I knew that I didn’t need to look very far to find the perfect bag to carry my pump and accessories! I chose Sarah Wells because I knew that their quality was amazing and that the brand takes pride in their work. 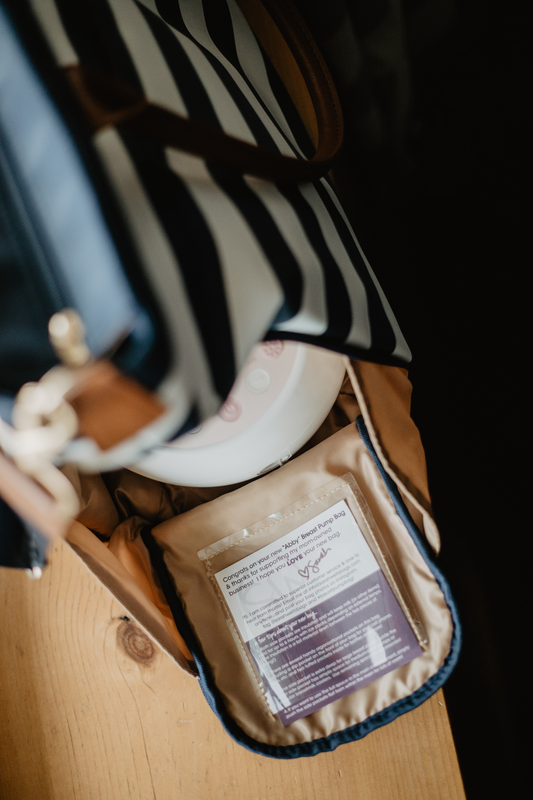 Sarah Wells sent me this bag to review for you guys, and I’m adding it to my must haves list – especially for Moms to preemies. You see, when my twins were in the hospital, I had to use a pump at times while I was there. I also had to use a pump every couple of hours, so keeping mine nearby was important to me. I was given a loaner pump for when I was at the hospital, but I still enjoyed using my Spectra just a little bit more. The settings were tailored to my needs and I felt like being able to bring my pump was just easier. 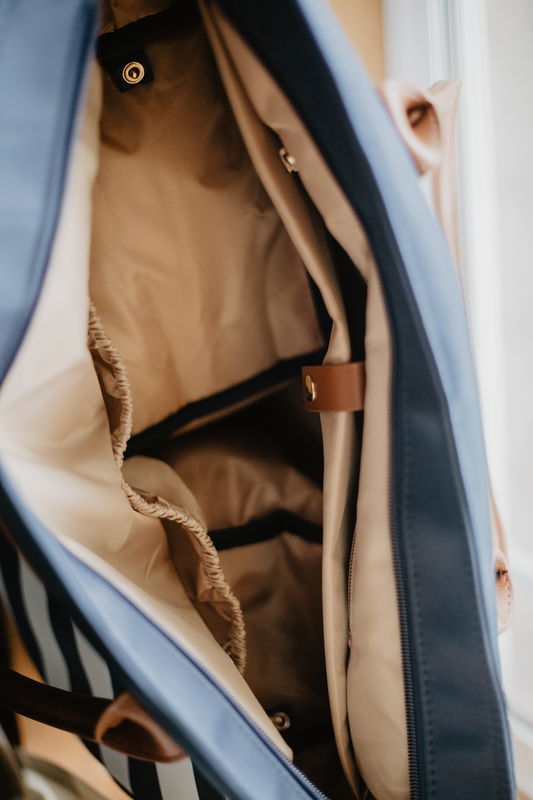 When my Sarah Wells Abby bag arrived, I was SO happy with the quality of the bag, it was sturdy and made from materials that could be wiped clean very easily. I had another diaper bag from a different brand that I had previously used to carry my pump and accessories in, and when I was toting around some liquid gold, it spilled and reached the outside of the bag. This caused a stain that I cannot get out, and was very disappointing! So the outside material of the bag, is EVERYTHING! So seeing this easy clean material was such a big thing for me. I loved how the handles were long enough to wear over the shoulder, or carried in hand. I tend to need to carry my bags in different ways depending upon what I’m juggling whether it’s babies, their car seats, groceries etc. 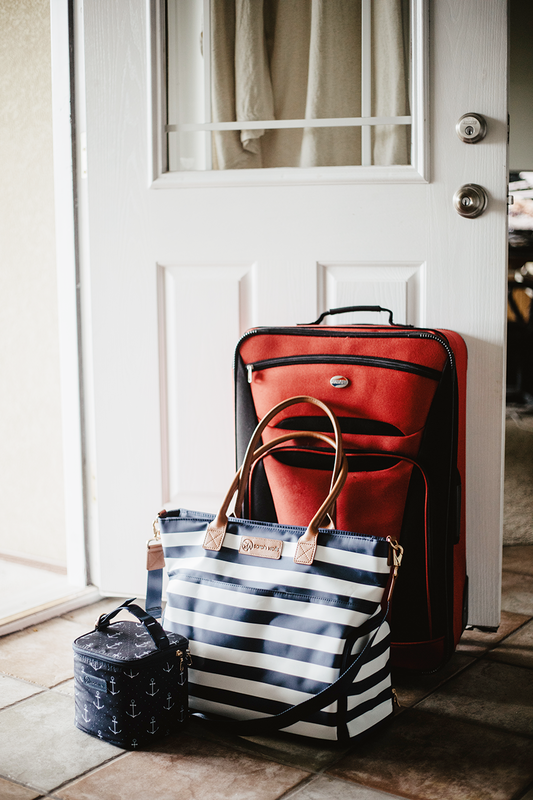 I was able to fit everything from my diaper bag into my Sarah Wells Abby bag, which was astonishing to me, and made things a million times easier for when it was time to go out. I recently went on vacation, and I needed to bring my pump with me, this bag was a lifesaver! It made traveling easier, it helped for easy transportation of the pump, and I knew that I didn’t have to worry about it getting damaged due to being shoved in the trunk with the rest of my things. I also put the twins’ clothing in the Sarah Wells bag to keep things compact and easy to carry in and out of the hotel. While at the resort, we used the bag as a carrying case for all of the children’s pool time needs like dry clothes, sunscreen and goggles along with my pump, so that I could use a cabana and pump outside instead of heading all the way back to my room. The Abby bag from Sarah Wells has several pockets to carry much more than a breast pump! There is a laptop/tablet sleeve, large center pocket, and two pockets for a pump depending upon which side you like to carry your pump on. I also loved the little feet at the bottom of the bag to keep it standing upright and to keep it clean. I can tell that this bag was made for durability in mind, with easy zippers that are sturdy. This bag is a great investment for me and other Moms who rely heavily on their pump. Along with my Sarah Wells Bag, I also received a Cold Gold Cooler to store my milk while on the go! This little pouch holds an ice pack as well as a day’s worth of milk for me! I’m not a huge producer, so what I do pump is extra precious to me, and is so important to be able to keep cold and available to the boys, especially while on vacation! The Anchors print pairs perfectly with the Abby Navy Stripe bag for a nautical feel which I just find to be adorable! 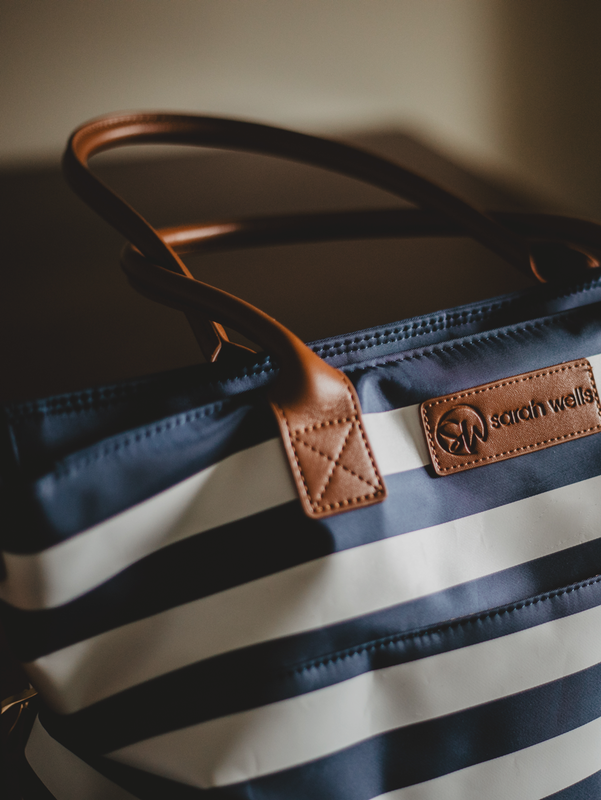 Overall, I love the Sarah Wells line of products and I recommend them to anyone who is searching for the perfect baby shower gift or pumping bag!